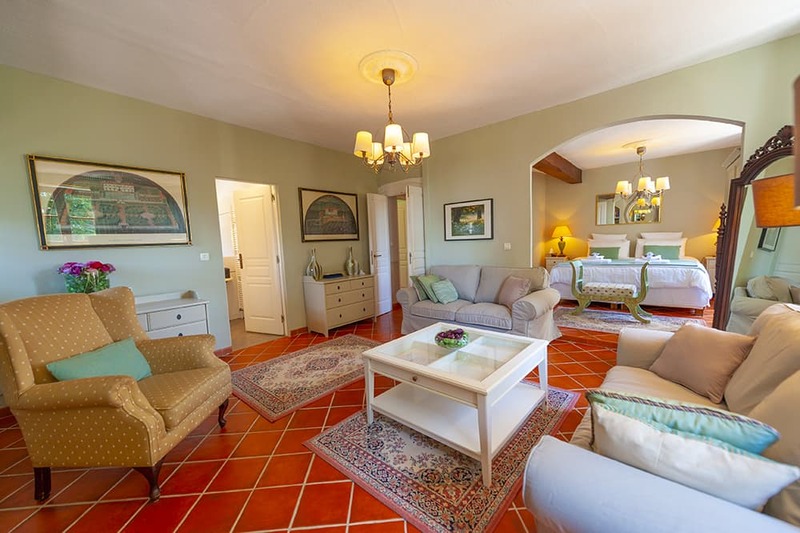 A beautifully renovated 18 acre country estate near Carcassonne. Domaine de Nérige is the South of France home of Sandie and David Apthorp. On a working wine domaine, the country estate house, barn, outbuildings and grounds have been completely renovated from ruins. The long, private drive takes you through the vineyards to the estate which affords spectacular views of the open countryside. On a clear day you can see down the valley all the way to the snowy peaks of the Pyrénées. In private grounds with 18 acres of woodland, open fields and vineyards, it is in a secluded location, yet only 10 minutes from all amenities in Limoux and just 20 minutes from Carcassonne. 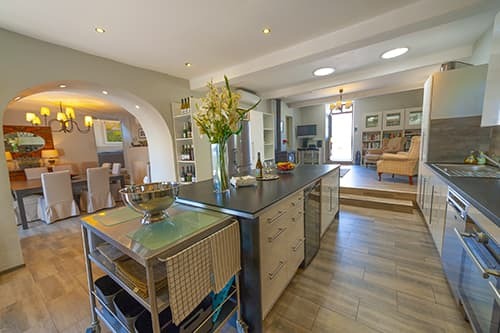 Domaine de Nérige now offers a luxurious self-catering holiday home, local wine production, cookery classes and creative writing courses. 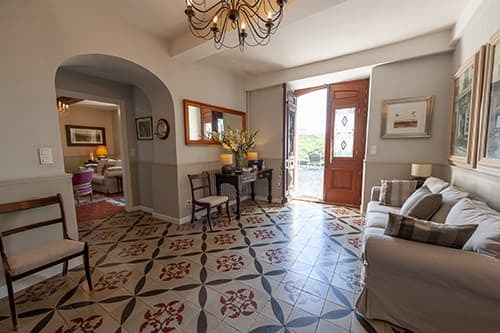 The holiday rental house can sleep up to 14 guests and offers a private swimming pool, games room and beautiful interior design throughout. It is available for self-catering holiday rental all year round with our partner Pure France. The domaine is located close to the village of Saint-Martin-de-Villereglan. 20 minutes south of Carcassonne, with its world famous citadel. 10 minutes from the historic town of Limoux with all amenities. Our party of 12 plus four small people had a fantastic week in Domaine de Nérige recently. The house is spacious and beautifully furnished and decorated and the terrace and pool areas were great places to relax. We had the choice of two very well kitted out kitchens and also made great use of the barbecue and outdoor dining facilities. The games barn and boules court were well used and there was parking for a fleet of cars. It was a ten minute drive down the hill to Limoux where the supermarket provided for all our food and drinks needs. Our biggest praise goes to the owners Sandie and David. They were on hand and extremely helpful and friendly on the few occasions when we needed them but for the rest of the time we didn't know they were there. Perfect hosts. I wouldn't hesitate to recommend a stay here for a large group of family and friends......we would love to return at some point in the future. Thank you Sandie and David.....all your hard work renovating this beautiful home has certainly paid off. 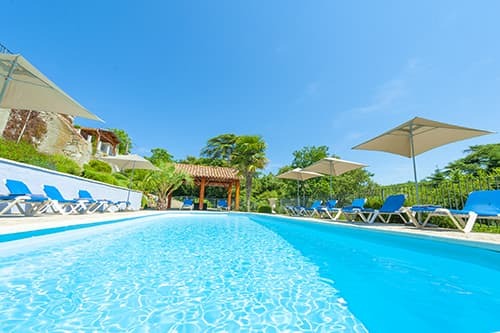 Holiday reservations at Domaine de Nérige, in partnership Pure France. The Pure France team are all personally familiar with the accommodation and facilities on offer at Nérige and can answer any questions you may have, from early to late, 7 days a week. For your peace of mind, all reservations at Nérige are secured and backed by the industry leading systems put in place by Pure France, including full PayPal, Visa and MasterCard payment facilities.